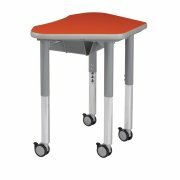 Promote productive collaboration in your classroom with Petal Junior Student Desks. A unique shape lets you put desks together into clusters of six with a perfect space for the Lazer teacher's desk, or create a full pod with eight student desks. A teacher can also walk into the middle of a cluster of six and work with students individually or in groups. When you want students to work independently or in smaller groups, all they have to do is move the desks right into the new configuration. 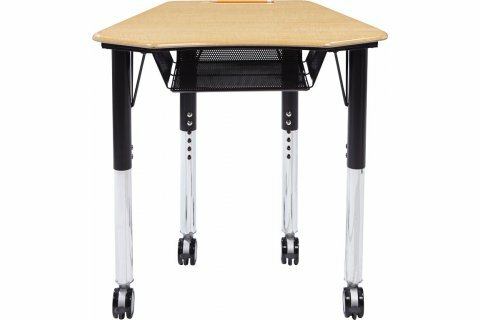 Optional casters make the job of re-configuring the learning space even easier. Tough school desks are essential in the bustling modern classroom. Sturdy, tough-gauge, Hercules legs provide incredible support. 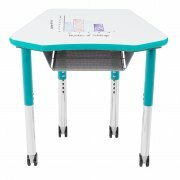 Students and teachers alike will enjoy these functional, flexible desks. Teacher Friendly: Open space in a cluster of six student desks lets a teacher stand comfortably in the middle, or add a Lazer Teachers Desk. Student desks can also be positioned in full clusters of eight. Accessible Storage: Optional book box offers the perfect place for pencils, notebooks and more. Comfortable Workspace: A contoured inside edge promotes healthy positioning. Full Support: Adjustable-height, 18-gauge Hercules legs are mounted directly to the metal frame. All metal-to-metal connections make this desk extremely durable. 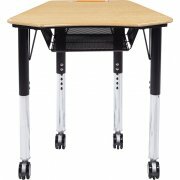 Optional Mobility: Locking casters available to make it easy to rearrange desks for various tasks and projects. Great Options: Available in a selection of work surface hues.